After a near perfect run in the preliminaries, Jack Doohan had to settle for fourth in the Final at the European OK-Junior Championship round in Finland overnight. Competing on the fantastic looking Alaharm circuit that’s part of an amusement park (it features some great elevation changes, cambered corners with non-constant radii and a crossover bridge with a chicane under it – I don’t think it would pass a track inspection in Australia! 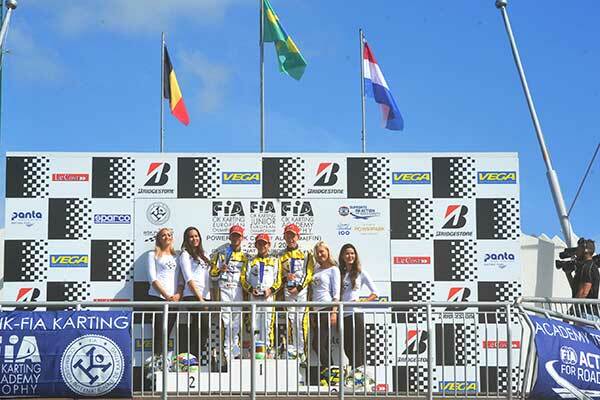 ), Doohan had qualified fastest and won three of his four heats to start on pole for the Final. He led the early running but never really established a break. Championship rival Jonny Edgar (Exprit) hit the lead at half race, but Doohan (FA) quickly re-passed. A few laps later Edgar got through again and this time pulled a gap. 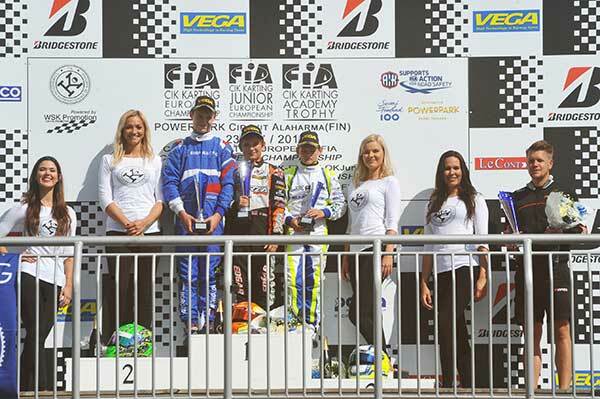 The final lap was a disaster for the Australian as Russian Tony Kart driver Ilya Morozov made a move for second, bringing Jack Thompson through with him. Jack dropped to fourth and was lucky not to receive a penalty as his nosecone was hit as Thompson went by. The result has pushed Doohan up to 8th in the Championship standings with one round to go in Sweden. Edgar enjoys a strong 24-point break over fellow Brit Harry Thompson. The winners of the 5th round of the CIK-FIA European Championship in Finland are Taoufik (FA Kart-Vortex) and Edgar (Exprit-TM), the leaders in OK and OKJ respectively. The Academy race was won by Melo (BR – Exprit-Vortex) but the series Trophy goes to Handsaeme. 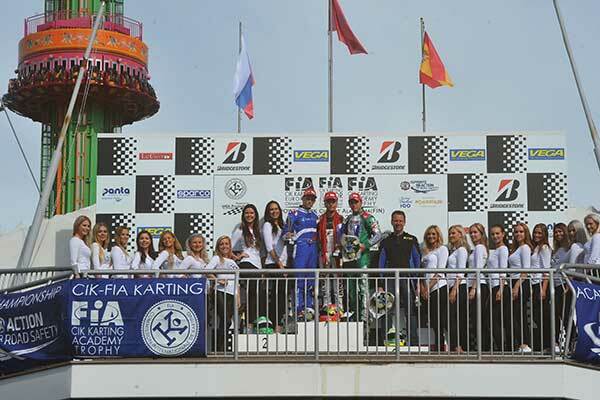 The spectators who followed the race found their man of the hour in the Moroccan driver Sami Taoufik (FA Kart-Vortex-LeCont). Taoufik overtook the Spanish Pedro Hiltbrand (Tony Kart-Vortex) at the beginning of the race and, from that moment onward, Hiltbrand could not keep the pace and lost some other positions. So, there was room for other protagonists, such as the Finnish Paavo Tonteri and the Russian Pavel Bulantsev (both on Tony Kart-Vortex): the latter even managed to pass Taoufik, even though for only one lap. The driver from Marrakech, in fact, managed to take back the leadership almost immediately and to win the race. Taoufik is the new leader of the Championship, in the day of his maiden victory for a driver coming from Morocco in a CIK-FIA race. Behind him, the runner-up was Bulantsev, while Hiltbrand managed to recover some positions and to finish third ahead of Tonteri. The Australian Jack Doohan (FA Kart-Vortex-Vega) attacked in Qualifying but in the Final the English Jonny Edgar (Exprit-TM) was too tough a rival for him. The two drivers swapped positions at the head of the race many times, but in the last laps it was Edgar who had the upper hand after a thrilling duel. The Russian Ilya Morozov (Tony Kart-Vortex) took advantage of the situation: placing a daring overtaking manoeuvre on the last lap, he managed to pass Doohan and to place 2nd. For Doohan it was a fatal blow: he was overtaken also by the English Harry Thompson (FA Kart-Vortex) who grabbed the 3rd place in the last metres of the Final. Edgar keeps the head of the Championship, which is finishing next week in Sweden. He was the best in Qualifying and he won the Final: the Brazilian Francisco Melo D. Porto had his first success in the Academy Trophy. Second place for the Belgian Xavier Handsaeme, who was declared the winner of the Trophy championship. Third place, after a recovery from the sixth row, for the Dutch Tijmen van der Helm (all drivers on Exprit-Vortex-Bridgestone).